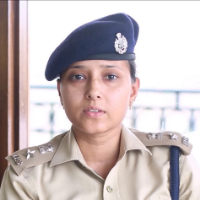 Ms Nivedita Kukreti Kumar is an IPS officer from the batch of 2008, who is currently posted in Uttrakhand Headquarters Dehradun as AIG-PM. She has studied from Mayo College, Ajmer and there after went to Indraprastha College and graduated in History Honors. And finally pursued her MA and M Phil in Indian Medieval History from JNU. Indian Police Service (IPS) is one of the pillars of the steel frame on which this country stands. An IPS officer plays a very important role in maintaining the internal security, law and order and prevention of crime. They can also serve in various para-military services as well as the day to day affairs and the peace of the country is maintained. "I am an IPS officer from the batch of 2008, currently posted in Uttrakhand Police Headquarters Dehradun as AIG-PM. I have studied from Mayo College, Ajmer and then went to Indraprastha College for women and graduated in history honors. After that I went to Jawaharlal Nehru University from where I pursued my MA and M Phill in Indian Medieval history."